Center isn’t a position necessarily known for being valuable in pass protection, but when you’re as good at is as Hudson is, it’s still worthwhile. He was the highest-graded pass-blocking center in the NFL once again this season with a 90.8 overall grade while only allowing five pressures all season. 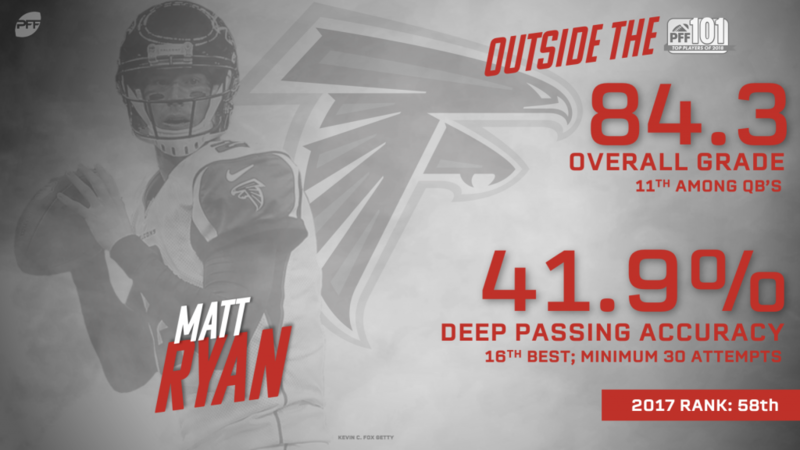 The Falcons’ starting quarterback was once again among the cream of the crop at his position and ended the year ranked 11th among signal-callers with an 84.3 overall grade. Ryan was lights out from a clean pocket, completing 322-of-434 attempts for 3628 yards, 27 touchdowns, three interceptions and a fifth-best passer rating of 116.6 on throws where he was kept clean from pressure. Short may have taken a step back from his performance in 2017, but he was still among the best interior defenders in the league. A true nightmare against the run, Short finished the 2018 campaign ranked 18th in run-defense grade (85.3) and tied fifth in run stop percentage (12.6%). Unfortunately, his pass-rushing prowess took a distinct step back as he only managed 34 pressures on the season. Amos was once again a top-10 graded safety in coverage. He just didn’t have the splash plays to push him over the edge though, as the Bears’ safety racked up only 17 stops on the year which ranked 32nd among safeties. Tuitt capped off his second straight season with an 80-plus grade and took his run defense to another level in 2018. His 86.1 run defense grade was a big jump from 71.8 a year ago as he didn’t miss a single tackle all season long. 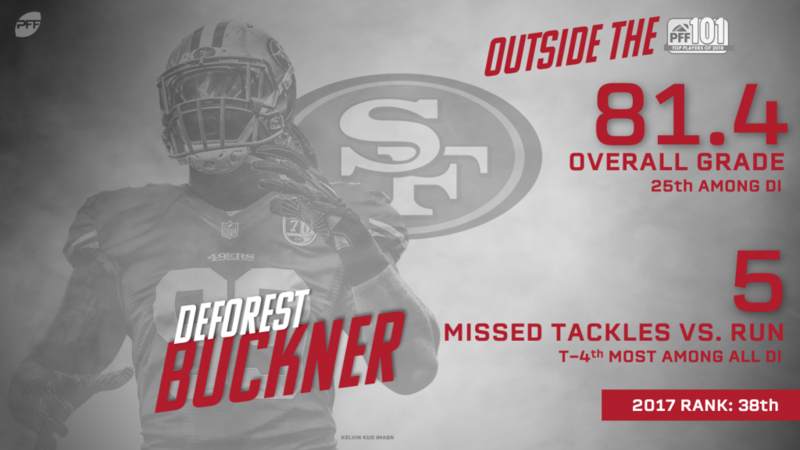 Earning 81.0-plus grades in each of the past two seasons, San Francisco 49ers’ DeForest Buckner is quietly becoming a productive, consistent force for the team’s defense at just 24 years young. In 2018, he picked up career-highs in defensive stops (37) and total pressures (53) playing a mix of defensive interior and edge defender for the 49ers. Stefon Diggs picked up 1,000-plus receiving yards and an impressive 81.1 overall grade in 2018, adding to his remarkably consistent career. He’s now earned 78.4 or higher overall grades in all four of his NFL seasons. 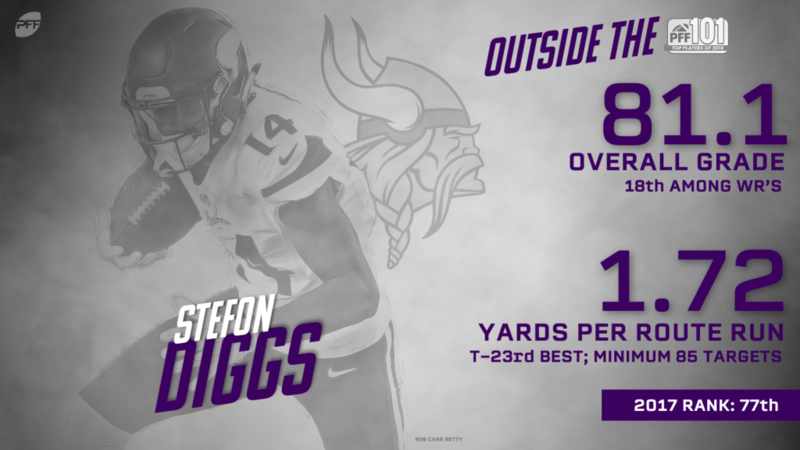 In 2018 specifically, Diggs logged just one drop and a 107.9 passer rating when targeted. He also caught 64.0% of his 25 contested targets in 2018, ranking second among the 28 wideouts with at least 20 contested targets. Catching 56.7% of his contested targets, Detroit Lions’ Kenny Golladay finished a few places behind Diggs on the list, ranking seventh among the same set of qualifiers in contested catch percentage. Golladay also earned a career-high 81.1 overall grade and had three single-game grades above 88.0 on the year. Weddle was once again an impact player versus both run and pass. He allowed a grand total of 111 yards in his coverage all season long. The safety’s tackling may have been his most impressive attribute this season. He missed all of five tackles on 78 attempts. Dallas Cowboys’ Tyron Smith didn’t post a banner year in 2018 compared to his previous career-highs, but his 80.1 overall grade and 86.6 pass-blocking grade were still among the best tackles in the NFL. He allowed just 18 total pressures across his 596 pass-blocking snaps on the year, which marked a career-low for the eight-year veteran.